Dear Eileen Moray Gray: Celebrated for your pioneering style that proved highly influential in the Art Deco era, you became one of the foremost women in furniture design and architecture. Eileen Gray (1878-1976) was the one artist working in Britain who chose to develop her designs in the “new” material lacquer and later chrome, steel tube and glass furniture. Advantage in her favor she was born of wealthy Irish parentage and the stirrings of creativity had its roots in childhood when her father encouraged her artistic interests. A trip to Paris in 1900 to visit the Exposition Universelle further fueled her design ambitions. Eileen Gray was fired with creative ambition, a furniture designer and architect, a woman determined to succeed as a pioneer of the Modern Movement in architecture. Eileen Gray spent her childhood in London and was the first woman to be admitted to the Slade School of Art where she took up painting in 1898 before undergoing an apprenticeship in a London lacquer workshop. While living in London Gray came across a lacquer repair shop in Soho where the owner showed her the fundamentals of lacquer work which had taken her fancy and later would become her métier. Upon moving back to Paris in 1902 she met Seizo Sugawara, who originated from an area of Japan that was known for its decorative lacquer work. She worked closely with Sugawara and quickly established herself as one of the leading designers of lacquered screens and decorative panels. During the 1920s and 1930s, Gray became a major exponent of the revolutionary new theories of design and construction and worked closely with many outstanding figures of the modern movement, including Le Corbusier and J P Oud. Her circular glass E1027 table and red, rotund Bibendum armchair were inspired by the recent tubular steel experiments of Marcel Breuer at the Bauhaus. Meant for lounging Gray’s Bibendum Chair was one of the 20th century’s most recognizable furniture designs with legs made of a polished, chromium plated, stainless steel tube. Its back/arm rest consists of two semi-circular, padded tubes encased in leather. The name Bibendum originated from the character created by Michelin to sell tires. At end of WW l Gray returned to Paris and was commissioned to decorate an apartment in the rue de Lota for millionaire; Madame Mathieu Levy, a trendy, modern woman. During this time Gray created the Bibendum chair along with most of the furniture, carpets and lamps, and installed lacquer panels on the walls. The Bibendum Chair was hardly like anything ever seen before and its originality was quite amazing at the time. The Art Critics loved the chair and the apartment’s minimalism and reviews in papers and magazines exclaimed that the furnishings were a “triumph of modern living.” Until her death in 1976, Eileen Gray continued to work on both major architectural projects and on a number of smaller furniture designs. In 1973 Gray granted the worldwide rights to manufacture and distribute her designs to Aram Designs, Ltd. London. 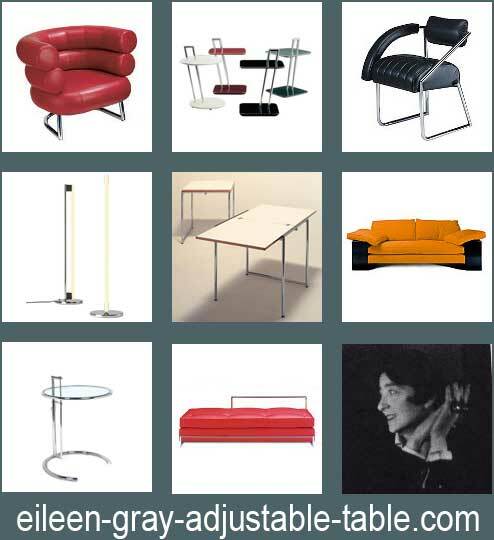 EILEEN GRAY’S HIGHLY ORIGINAL AND DARING DESIGNS ANTICIPATED MANY OF TODAY’S MODERN DESIGN TRENDS.